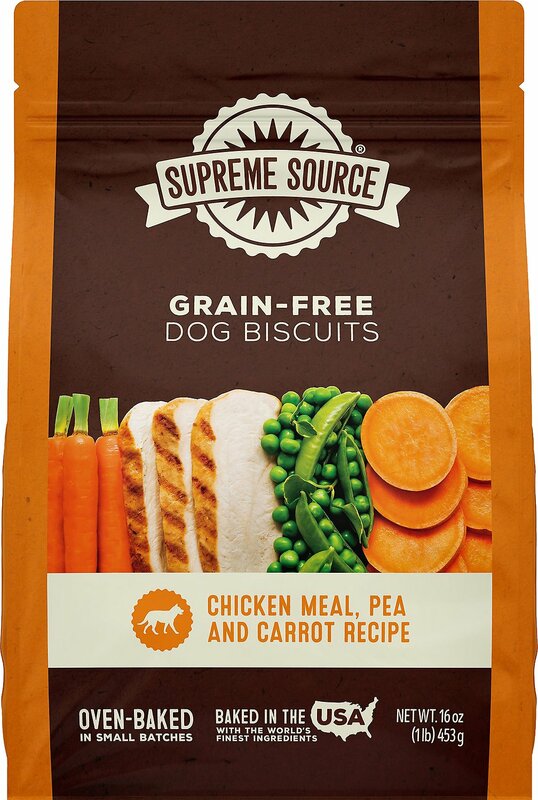 Snack foods don’t have to be junk food when you reward your best friend with Supreme Source Lamb Meal & Sweet Potato Biscuits Grain-Free Dog Treats. Made with love in the USA under the watchful eye of family-owned American Pet Nutrition, these crunchy gourmet biscuits are oven-baked to lock in all the savory flavors she won’t be able to resist. Chicken meal, which contains even more protein than fresh chicken, is the very first ingredient, followed by real peas and carrots that deliver essential vitamins and nutrients. In addition to being 100% grain-free, these treats are made without the use of corn, soy, artificial flavors or artificial colors. Crunchy gourmet biscuits are oven-baked to lock in all the savory flavors she won’t be able to resist. 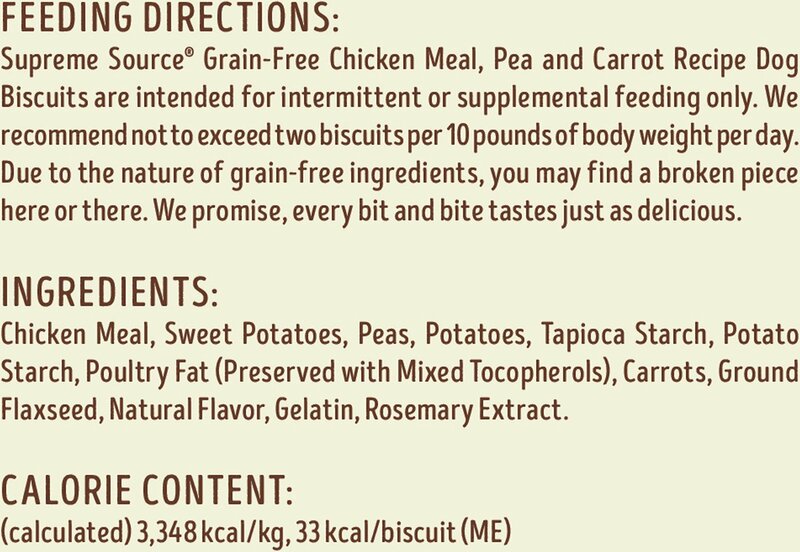 Chicken meal, which contains even more protein than fresh chicken, is the very first ingredient. Includes real peas and carrots that deliver essential vitamins and nutrients. 100% grain-free and made without the use of corn, soy, artificial flavors or artificial colors. Made with love in the USA under the watchful eye of family-owned American Pet Nutrition. Potatoes, Chicken Meal, Whole Peas, Sweet Poataoes, Potato Starch, Dried Beet Pulp, Chicken Fat (Preserved With Mixed Tocopherols), Carrots, Natural Flavor, Gelatin, Rosemary Extract. Intended for intermittent or supplemental feeding only. We recommend to not exceed 2 biscuits per 10 lbs of body weight per day. The folks at Supreme Source don't just want to feed your dog—they want to nurture him from the inside out. That's why their line of grain-free dog food is formulated with the protein and antioxidants your pup needs at every stage of his life. It's complete, balanced nutrition, made without corn, wheat, soy or anything artificial—only tasty, real ingredients that help your furry BFF thrive. You might not catch this kibble wearing a cape or spandex suit, but you'll still find something "super." In every bowl of Supreme Source, there are nutrient-packed superfoods chosen to boost overall health. Instead of boring and basic pet food ingredients, this kibble is locked and loaded with the fruit, legumes, leafy greens and powerful, flavorful foods that make this brand unique. Supreme Source believes that a happy tummy makes a happy dog—so, they add nutrient-rich, USDA organic seaweed to every recipe. This unique superfood is sourced from the crisp, rocky shore of Nova Scotia, sun-dried and blended into every bite to support your sidekick's healthy digestion. These tasty recipes provide a rich source of nutrients that you won't find in everyday pet food. With a powerful prebiotic punch in every bite, Supreme Source meals may support intestinal health, boost the overall immune system and add powerful antioxidants to your dog's daily diet. They're proud to offer your dog more than just a meal—it's a lifestyle! 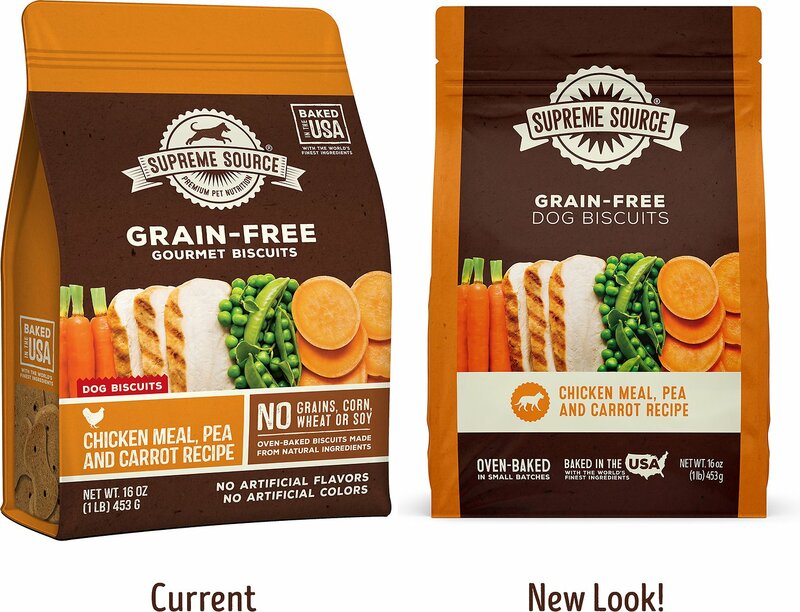 Supreme Source is a brand of food and treats made by American Pet Nutrition. They understand that pet parents are conscious of what they feed their pets and how it affects their health. Supreme Source aims to deliver, with more than 40 years of American-made, family-owned quality. By following the strictest standards, they strive to create safe, nutritious, delicious food that your pet is sure to love. Great Taste, Price & Healthy, TOO!! Hard too find Healthy Treats that dogs won't "Turn their Tails Up To" and also won't empty my wallet. But Supreme Source comes through on treats, just as they do with their food. My 4 dogs love the biscuits, and, though I Haven't Tasted them Myself, they sure Smell Good!!! Love my Supreme Source! Arf Arf! Will recommend to my friend Max! I purchased these for a friends dogs. They both need the grain free type. They loved them. Bruno eats just about any treat but this one he turns his nose away to. Not sure if it's the taste or smell but I wont buy again. 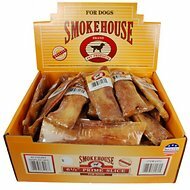 My dog absolutely loves these treats! I bought both flavors. We recently adopted an older dog with skin issues and were advised to keep him on a grain free diet. We tried a couple different grain free biscuits, but these are the ones he really likes. I wish Lola liked their food as much as she does their treats. She'll eat these but won't touch any flavor of their dry food line. We have this and the lamb flavor and she likes both. Neither flavor has caused any stomach upset, so I would buy these again. Although I have small dogs, these are the perfect size for stuffing their Kongs and does a great job of occupying them. My dog enjoys these treats. A good medium size biscuit, easily broken in half if needed.